Pewter Based/ Silver Plated/ Glass. Size- 12cm X 3.5 CmAfter Two People Get Married, They Begin There Life And Start To Build Their Own Home Together. 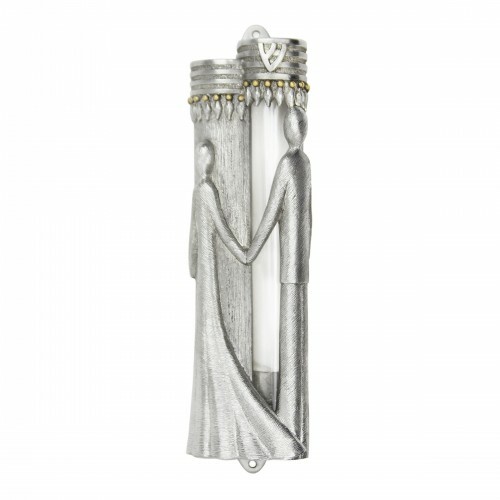 The Married Mezuzah Makes The Perfect Wedding Gift. The Mezuzah Comes With A Glass Insert, In Which Broken Glass From The Wedding Day Is Placed. The New Happy Couple Will Place It On Their Door Post, And Be Reminded Everyday Of Their Special Day As They Enter Their New Home.Pewter Based/Gold Plated/Size- 12.5cm X 2.5cmThe Stainglass Mezuzah Is Handpainted Mimicking The Look Of Stain Glass. The Tree Of Life Is Carved Out On The Mezuzah. You Instantly Have A Piece Of Art Hanging, The Second This Mezuzah Is Placed On Your Doorpost.